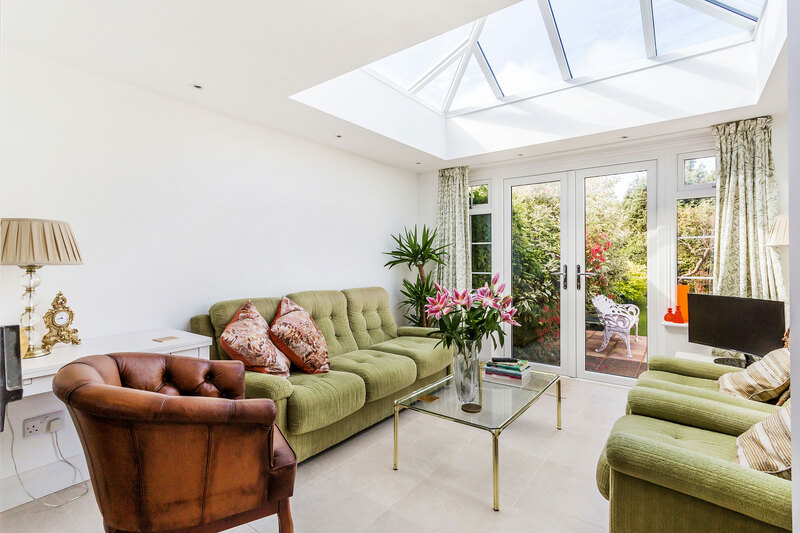 The Ultraframe roof lantern let light into the new orangery extension. 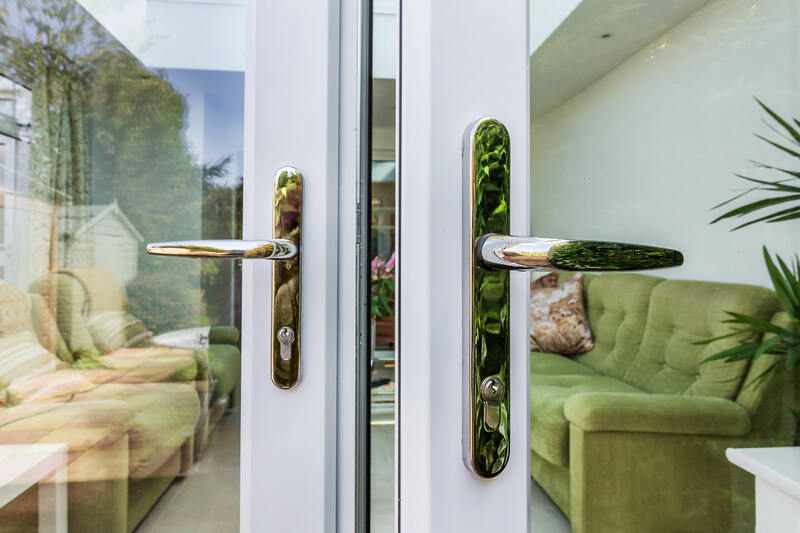 This product that was installed worked in close cooperation with the French doors and windows to let in lots of light. Mr Zadoyan was keen to extend his home in Banstead but wanted advice from the Castle team about the right orangery extension. We explained that we would be able to create a design that met his expectations in full and handle all aspects of the project. The brief was to create a traditional looking room that would act as a lounge area, with the aim of providing clear views of the garden. The interior needed to feel light, bright and warm, as it would be used all year round. We decided that a small orangery would suit Mr Zadoyan best. By building a room composed mostly of masonry, we would be able to create a comfortable space for relaxation or entertaining. The design means that this space can be used 365 days of the year. Mr Zadoyan also liked the idea of using an Ultraframe roof lantern to let light into his new orangery room. 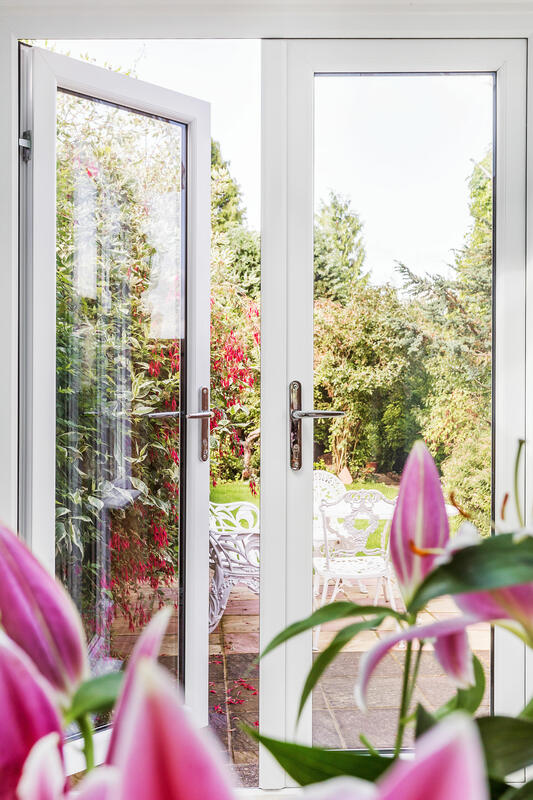 The product that we installed worked in close cooperation with the French doors and windows to let in lots of light. The orangery project was completed on time and to the complete satisfaction of Mr Zadoyan, who now uses his room often. 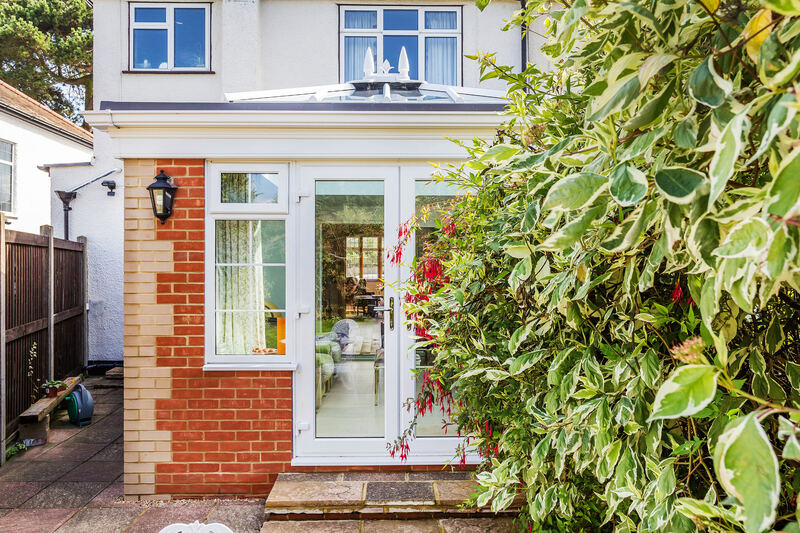 Call or email our team to find out how we can help you with your home extension plans, or use our VR tool. We spent a great deal of time talking to Mr Zadoyan about his expectations for the final use of the space so that no detail would be missed when designing his traditional orangery and that our vision would meet Mr Zadoyan’s expectations. 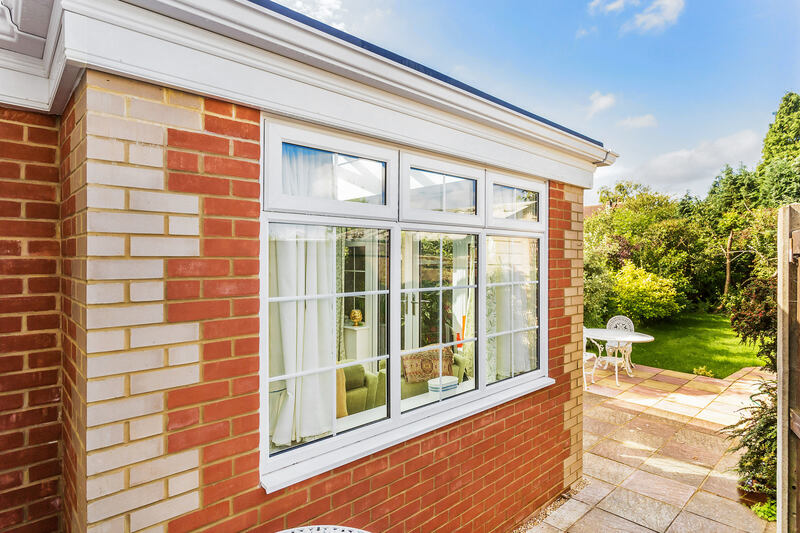 Here are the steps that we took to ensure that his new orangery extension looked and performed exactly the way he wanted it to. 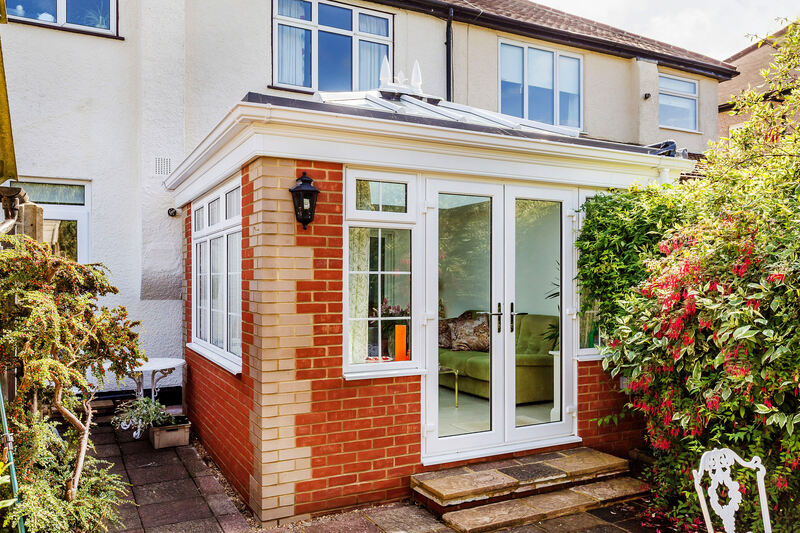 The lantern roof we used is the perfect choice for a small orangery extension build like the one depicted in this case study. Fewer bars are used in its design, resulting in better light filtration. Mr Zadoyan’s new living area benefited from plenty of illumination and felt more spacious due to the orangery roof we recommended. As revealed in the photos, the roof also features spotlights. This feature meant that the orangery felt cosy during evenings. It also made the room look and feel more like a natural extension of Mr Zadoyan’s property and the overall design is welcoming and adds overall market appeal. This style of lantern roof also features a thermally efficient ridge. By including this roof system in the blueprint for Mr Zadoyan’s orangery extension, we were able to reduce his overall U-values. This product is also extremely durable and designed to withstand a range of extreme weather conditions. 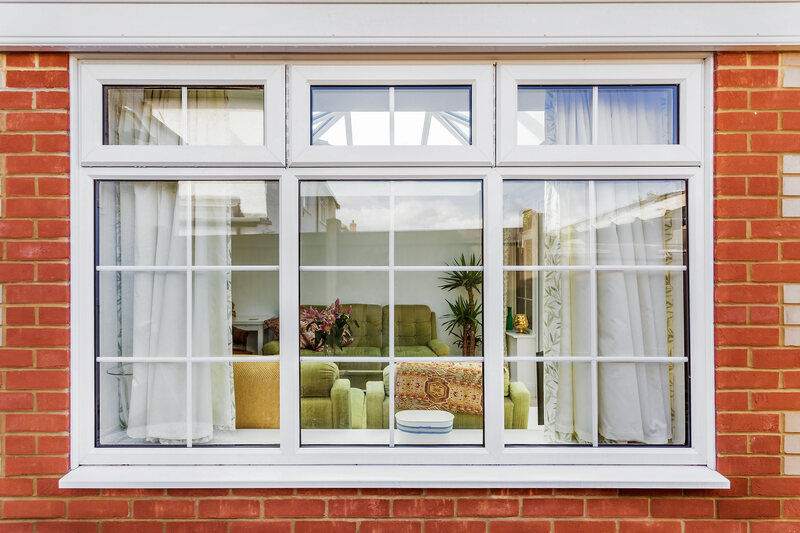 When we spoke to Mr Zadoyan, we recommended using high-grade uPVC French doors flanked by windows to direct light into the room. 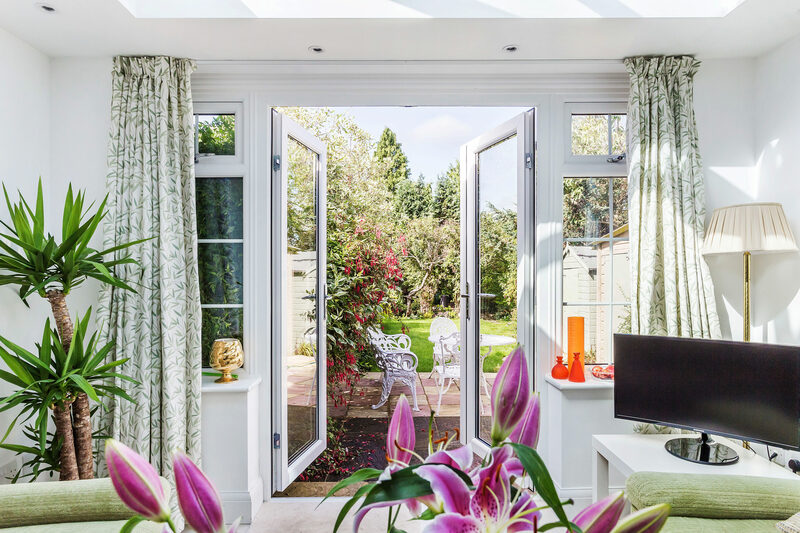 As revealed in the photos, the entire room design revolves around the garden, which acts as a feature in its own right and the French doors frame the outside area perfectly. The colour scheme captures the light delivered via the lantern roof, doors and windows. Incoming sunshine is then deflected to make the orangery extension feel welcoming and spacious. This means Mr Zadoyan can enjoy beautiful garden views always. We wanted to make sure that the completed orangery build would match the external appearance of Mr Zadoyan’s property. The structure we were charged with creating would need to complement the home it was attached too, rather than overwhelm it. The brick we used to construct the orangery contrasts well with the plastered exterior of Mr Zadoyan’s home but accentuates its traditional style. Use our new Virtual Reality Tour app to step inside an Ultraframe orangery and learn more about its features. You can also use our online design tool for ideas. 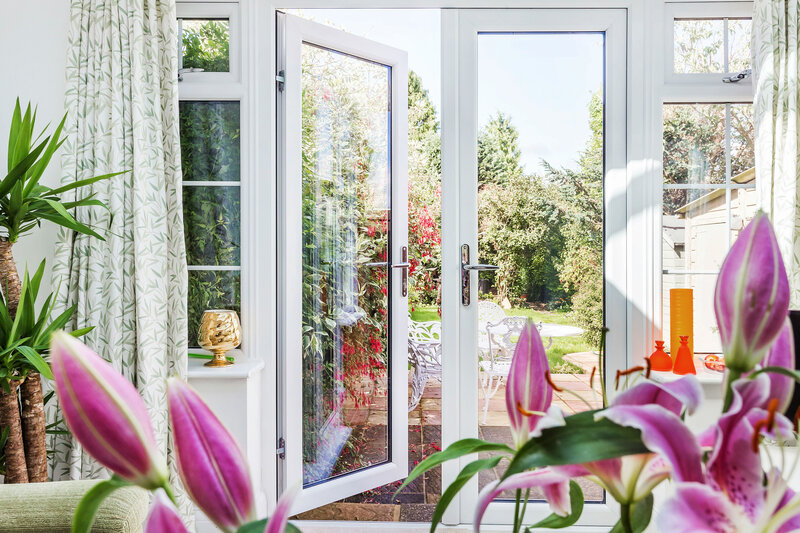 Contact the Castle Conservatories team to discuss your design ideas when ready, knowing that we’ll take care of every aspect of the project for you.